The Bradley Center, at left, is old news, replaced by the new Fiserv Form (at right), which has replaced it as the Bucks&apos; new home. Published Sept. 19, 2018 at 10:25 a.m. 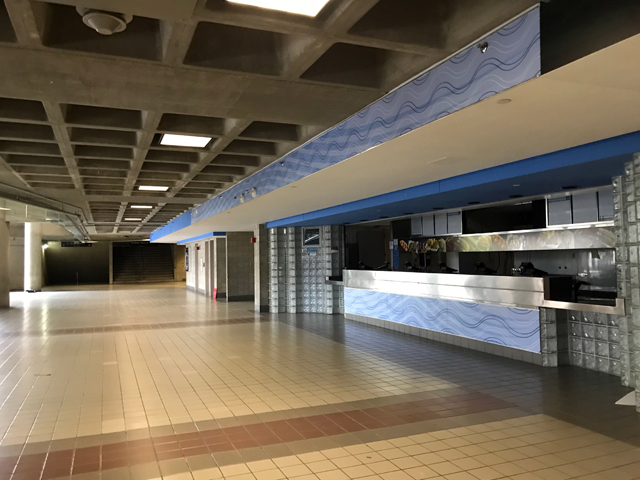 Although the official transfer of the Bradley Center to the Milwaukee Bucks for demolition didn't take place until Sept. 1, work to slowly pull down the structure, completed in 1988, began in July with the removal of the exterior signage. That was even before the final event – the annual Northwestern Mutual Life convention, July 21-25 – took place. 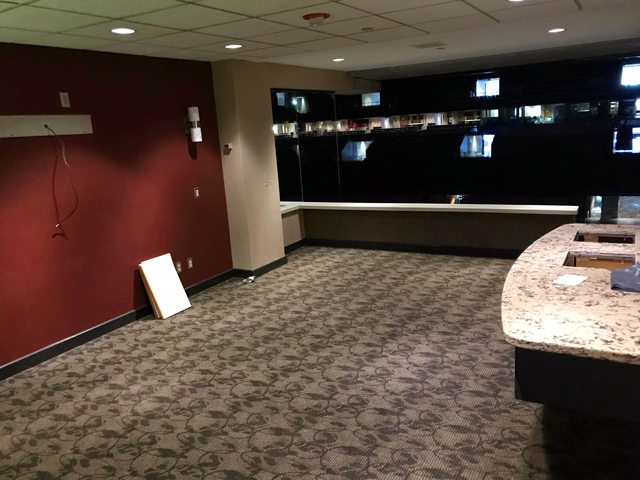 Earlier this year, the Wisconsin Center District – which owns the BC and the Fiserv Forum, which it leases to the Bucks – held an auction for memorabilia collected over 30 years, earning more than $160,000 for autographed guitars, microphones, costumes, photographs and other objects. 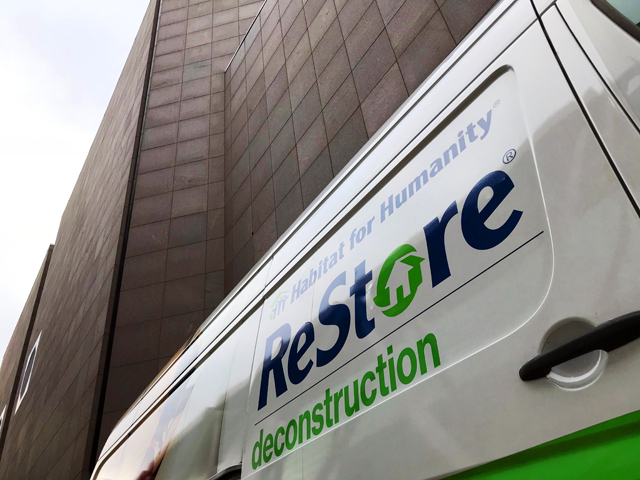 Since then, work began inside, too, and for 10 days – today is day six – Habitat for Humanity's ReStore team is inside salvaging for resale whatever can be put to new use. Once the interior is cleared out, demolition of the structure itself will move forward, beginning with the granite facing on the State Street side of the building. Jake Brandt, Habitat Milwaukee's director of marketing and communications estimates that the objects being salvaged will net about $50,000 in retail sales at the three Milwaukee-area shops. Sales at the Habitat stores – which do a brisk business in all sorts of items, including building materials, fixtures, appliances, furniture and other objects – help fund Habitat Milwaukee's neighborhood home building projects here, including the Midtown 100 project. A number of homes were recently completed as part of Midtown 100, according to Brandt. "We've already been able to salvage the lockers from the visiting team locker room as well as a lot of the lockers from the Admirals locker rooms," says Brandt. "We've been able to salvage everything from countertops, fixtures, furniture pieces. Really anything that's not structural that we see a resale value on, we were able to pull out." About 100 volunteers are helping Habitat on the Bradley Center project and about 20-30 volunteers are on hand each day. 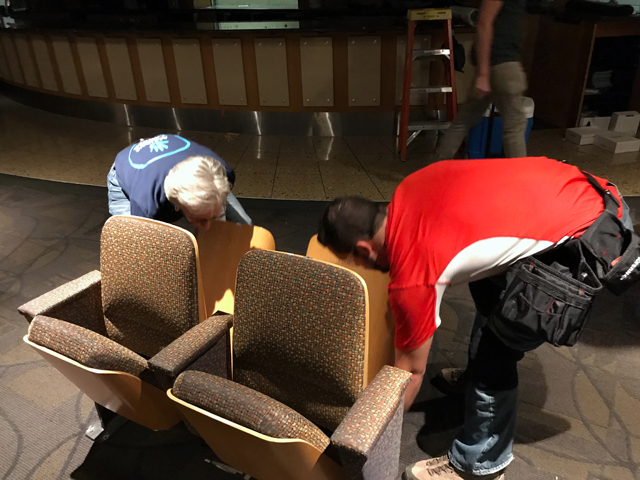 Today, the crew is working on removing seats from the luxury boxes and event spaces on the club level. "We (also) have our dedicated crew, our deconstruction crew of volunteers who are out 90 days a year, who have been here almost every day that we're doing this, and they're like a well-oiled machine. They are just cooking on this project. It's great to see them back day after day to help pull this stuff out." According to Brandt, work is ahead of schedule. 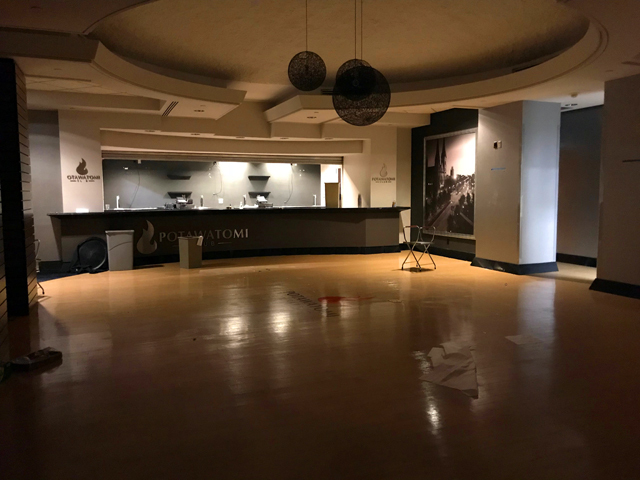 Habitat is hoping the Bucks will allow them to mine the Bucks' former locker room for goodies, too, though whether or not that will happen remained unclear this morning. Lockers from the Marquette locker room will be removed and available at ReStore. "We've been working with the Bucks," says Brandt, "and we went in, in advance, looking at what can we take, what's going to have a resale value in our store. It's really a great opportunity for us. "It's not every day we can say you can get a locker from the Bradley Center in our stores. This will bring in people that haven't been to our stores before." Wondering what time Sunday the Bradley Center roof will implode?